P.A. Nisbet is one of three contemporary artists in Santa Fe whose studios have deep roots with master artists long gone. "Though a living cannot be made at art, art makes life worth living. It makes living, living. It makes starving, living. It makes worry, it makes trouble, it makes a life that would be barren of everything—living. It brings life to life." Spoken by an artist who knew life: John Sloan (1871-1951). Sloan is associated with a group known as the Ashcan School who painted the grittiness of life in the cities of the Northeast. He visited Santa Fe in 1919 and for the next 30 years spent much of the summer there painting. The painting East at Sunset, Camino Monte Sol (1939) has egg tempera underpainting with varnish glazes, a technique he began to develop after moving to Santa Fe. It is a scene he may well have witnessed many times from the roof of his studio just off Canyon Road where he and his friends would often gather to look at the stars and the spectacular clouds. The studio was not only the scene of the prodigious production of art, but the wholehearted pursuit of pleasure. P.A. Nisbet, the latest in a long line of artists who have succeeded Sloan in the studio, would heartily agree with Sloan's dictum: "When painting a landscape it is desirable to walk through the clumps and around the bushes, around the trees, the houses and the rocks. Familiarizing yourself in this way with the subject, you will get a better concept of the thing and not a visual and false snapshot." P.A. 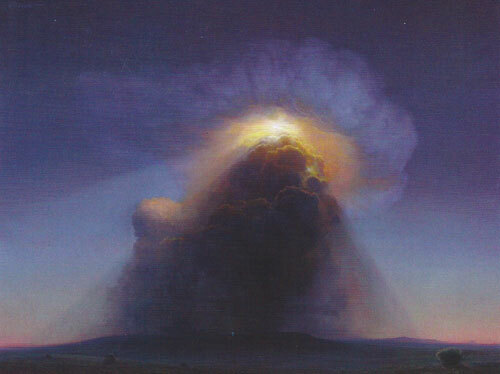 Nisbet, The Light Bearer, 1998, oil on canvas, 36"x48"
Nisbet has spent weeks painting and sketching within the depths of the Grand Canyon and at other sites that appear in his luminous landscapes. He absorbs and then reinterprets. "I try to put the viewer into a space and often, the space is in my mind," he says. As he assembles his impressions of the landscape into the composition of a painting, the viewpoint often puts the viewer in a spot that would actually be in mid-air. The Light Bearer portrays an effect that doesn't happen in nature, but to the observer of Northern Mexico skies seems completely real. The flashes of lightning in the late evening from the cumulonimbus clouds have been concentrated into one source of light that casts the shadow of the lower clouds onto the ground. He carries on the tradition of evoking the spirit of the landscape that Sloan did in the same space.